353 Beacon is located on the south side of Beacon, between Fairfield and Gloucester, with 351 Beacon to the east and 355 Beacon to the west. 353 Beacon was designed and built ca. 1870 by Frederick B. Pope, for speculative sale, one of a symmetrical pair of houses. At about the same time, he also designed and built a third house at 351 Beacon. 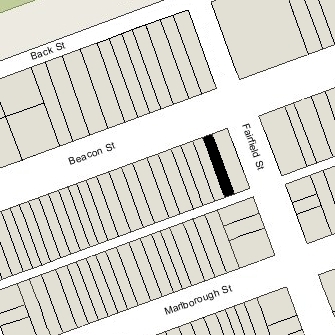 Frederick Pope purchased the land for 353-355 Beacon in several transactions. On April 7, 1869, he purchased an 11 foot wide lot from Sidney Homer and a 7 foot wide lot from John Worster, and combined them into an 18 foot lot for 355 Beacon. On March 21, 1870, he bought the 18 foot lot to the east from house builder and contractor George Martin Gibson for 353 Beacon. All of the land was part of one of several parcels originally purchased from the Boston Water Power Company on January 29, 1866, by a real estate investment trust formed by John Templeman Coolidge, Franklin Evans, and Charles Henry Parker. The trust had subdivided the property into lots, which it sold to investors and builders, who then frequently resold the lots to others. Click here for an index to the deeds for 353 Beacon. On September 5, 1870, 353 Beacon was purchased from Frederick Pope by Rev. James William Thompson, pastor of the Second Church in West Roxbury, who transferred it on the same day to his daughter, Mary (Thompson) Loring, the wife of Joseph George Loring. The Lorings made it their home. Joseph Loring was a commission merchant with strong ties to Malaga, Spain, where he had been born. 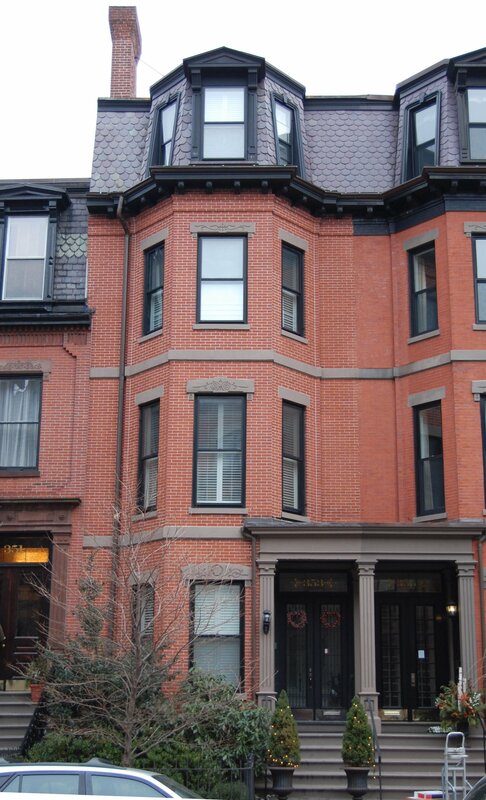 Living with them at 353 Beacon was Jorge Oyarzabal y Bucelli, the Nicaraguan consul, Joseph Loring’s first cousin. Joseph Loring was the son of George Loring and Maria del Rosario (Oyarzabal y Herrera) Loring, and Jorge Oyarzabal y Bucelli was the son of Juan Miguel Oyarzabal y Herrera and Maria Asuncion (Bucelli y Juan) Oyarzabal. The Lorings and Jorge Oyarzabal y Bucelli previously had lived at 68 Chestnut. They continued to live at 353 Beacon until about 1873, when they probably moved to Malaga, where Joseph Loring died in October of 1873. On June 17, 1873, 353 Beacon was purchased from Mary Loring by William Perkins, trustee for the benefit of Martha Willis (Alger) Tyler, wife of John Tyler, Jr. The Tylers made it their home. They previously had lived at 48 West Fourth. He was merchant and auctioneer. Several of the Tylers’ adult children lived with them, including Adeline Blanchard (Tyler) Hawes, widow of Charles Henry Hawes; William Perkins Tyler, an iron dealer and manufacturer of steel tubes; and Edward Royall Tyler, a tea merchant and then an iron and steel manufacturer in partnership with his brother, William. Adeline Hawes’s children – Charles Henry Hawes, Jr., Martha A. Hawes, and Cyrus Alger Hawes – also lived with them. Martha Hawes married in April of 1880 to Frank Moseley, an auctioneer and commission merchant, and they moved to Dorchester. John Tyler died in January of 1881. Martha Tyler continued to live at 353 Beacon with their sons, William and Edward, daughter, Adeline Hawes, and grandsons, Charles and Cyrus Hawes. Edward Tyler married in June of 1881 to Jennie Louise Cory. After their marriage, they moved to 369 Marlborough. During the 1882-1883 winter season, Martha Tyler and her family were living elsewhere and 353 Beacon was the home of Nehemiah Webster Rice and his wife, Josephine (Emery) Rice. They previously had lived at 59 Chester Square. Nehemiah Rice was a dealer in leather, hides, and wool. By the1883-1884 season, they had moved to 341 Commonwealth. By the 1883-1884 winter season, Martha Tyler had resumed living at 353 Beacon. William Tyler and Adeline Hawes continued to live with her, as did her grandson, Charles Hawes, a stockbroker. Cyrus Hawes moved at about this time to 136 Newbury to live with his brother-in-law and sister, Frank and Martha Moseley, who had moved there from Dorchester. Cyrus Hawes was a partner in Hawes & Kirtland, upholsteres and drapers. William Tyler moved to the Parker House Hotel in the late 1880s. Adeline Hawes died in March of 1891 and at about the same time her son, Charles, moved away. Also in 1891, Edward Royall Tyler moved to 353 Beacon with his young daughter, Edith Madeleine Tyler. They previously had lived at 316 Beacon, where his wife, Jennie, had died in April of 1890. Edward Tyler continued to live with his mother during the 1899-1900 winter season. He moved back to 316 Beacon during the 1900-1901 season, but returned to 353 Beacon by the 1901-1902 season. Martha Tyler died in November of 1902. Edward Tyler again moved back to 316 Beacon for the 1902-1903 winter season (during which his daughter, Edith, married Herbert Thorn King of New York City), but then once again returned to 353 Beacon by the 1903-1904 season. The trust established for Martha Tyler’s benefit had continued to own 353 Beacon, and on September 17, 1903, it was acquired from Frank Moseley, the current trustee, by Martha Tyler’s granddaughter, Mary Dwight (Foote) Wendell, the wife of Ten Eyck Wendell. The Wendells lived in Casanovia, New York, and 353 Beacon became the home of her mother, Mary Otis Alger (Tyler) Foote, the widow of Edward Foote. Edward Foote had been a broker and railroad contractor in New York City. Edward Tyler continued to live at 353 Beacon with his sister until the fall of 1905, when he moved to Nice, France. 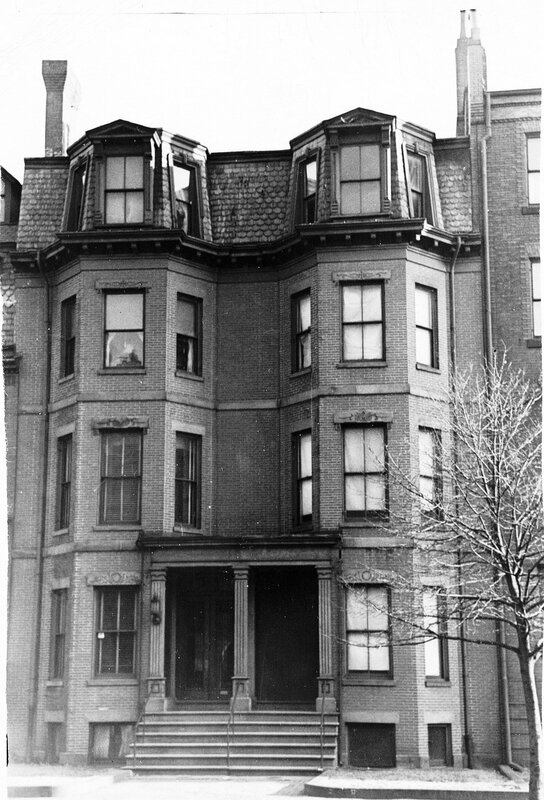 Mary (Tyler) Foote continued to live at 353 Beacon until about 1924, sharing the house with other residents (it was her Boston residence but she spent much of her time elsewhere). During the 1905-1906 winter season, 353 Beacon was the home of attorney Walter Ayers and his wife, Harriet (Adams) Ayers. They had moved from Duluth, and by 1907 were living in Brookline. During the 1906-1907 winter season, it was the home of Mrs. Hope Ives (Binney) Powel, widow of Samuel Hare Powel. Her usual residence was in Newport. Mary Foote lived at 353 Beacon the next two seasons, but during the 1909-1910 winter season, it was Mrs. Powel’s home once again (her son, Samuel Powel, had graduated from Harvard in 1908 and had married in April of 1909 to Grace Elizabeth (called Elsa) Putnam, daughter of architect John Pickering Putnam, Jr.). Mary Foote was again living at 353 Beacon during the 1910-1911 and 1911-1912 winter seasons. From December of 1912 through March of 1913, 353 Beacon was the home of Arthur J. Pierce and his wife, Sally (Crocker) Barr Pierce. He was a paper manufacturer in Bennington, New Hampshire, which was their usual residence. Helen Barr and Elizabeth Barr, Sally Pierce’s daughters by her former marriage, to James Cummings Barr, lived with them. Elizabeth Barr was a debutante that season. During the 1913-1914 winter season, 353 Beacon was the home of Jacob Herbert Sawyer, a retired cotton manufacturer, and his wife, Emily James (Ladd) Sawyer. They had married in March of 1913 and 353 Beacon probably was their first home together. He died in October of 1914. Emily Sawyer continued to live at 353 Beacon for the winter, and then moved to 453 Beacon. Mary Foote lived at 353 Beacon for the next three seasons. During the 1917-1918 winter season 353 Beacon was the home of Mary Foote’s son-in-law and daughter (who owned the property), Ten Eyck Wendell and Mary Dwight (Foote) Wendell. Their usual home continued to be in Casanovia, New York. Mary Foote was living at 353 Beacon again during the 1918-1919 winter season, but she spent the next two winters seasons in the south and it was the Boston home of Herbert Frederick French and wife, Edith (MacGregor) French. Their primary residence was in Randolph. He was a certified public accountant, specializing in the shoe and leather business, and president of the Randolph Savings Bank. By 1922, they had moved to 167 Marlborough. Mary Foote spent the 1921-1922 winter season at 353 Beacon. During the 1922-1923 winter season, she was living in New York City and 353 Beacon was the home of novelist and suffragette Miss Eugenia Brooks Frothingham. She had lived at 476 Beacon in 1922. Miss Frothingham moved to Cambridge by the 1923-1924 season, and by the 1925-1926 season was living at 297 Marlborough. Mary Foote resumed living at 353 Beacon during the 1923-1924 winter season, and was living there at the time of her death in June of 1924. By 1925, 353 Beacon was the home of Miss Katherine (Kate) Irving Sanford. She previously had lived at 387 Marlborough. She also maintained a home in Taunton. She had moved by 1926, probably to her home in Taunton. During the 1925-1926 winter season, 353 Beacon was the home of John Richard Thorndike and his wife, Caroline Lydia (Wyeth) Thorndike. They previously had lived in Brookline. They divorced in July of 1926 and he moved to an apartment at The Ericson at 373 Commonwealth. 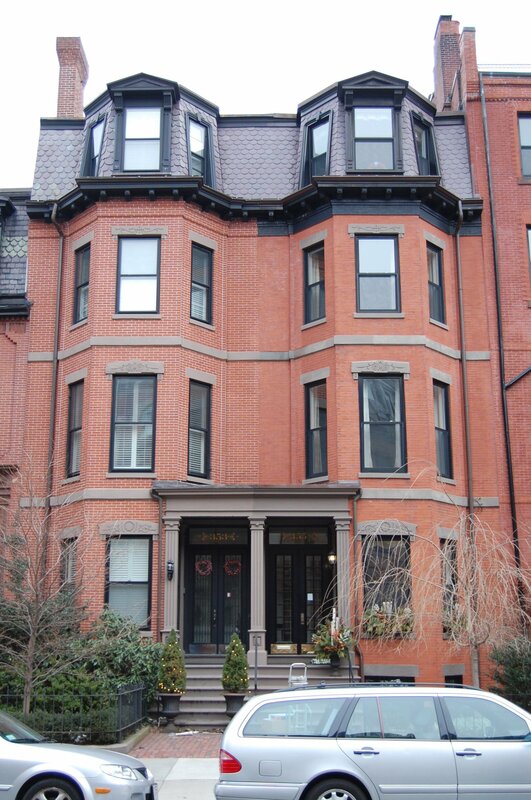 353 Beacon was not listed in the 1927 Boston Blue Book. By the fall of 1927, it was the home of George Abbott Osborne, a professor of mathematics at MIT. He had lived at 10 Commonwealth earlier in the year. He died in November of 1927. He was unmarried. In 1928, 353 Beacon was the home of attorney George Chandler Coit and his wife, Alice Chapman (Atwood) Coit. Their usual residence was in Winchester. The house was not listed in the 1929-1933 Blue Books and 1929-1933 Lists of Residents, and was shown as vacant in the 1930-1933 City Directories. During the 1933-1934 winter season, it was the home of attorney John Mathew Barry and his wife, Dorothy Catharine (Miller) Dudley Childs Barry. In 1932, they had lived in Newtonville. On November 23, 1936, 353 Beacon was purchased from Mary Wendell by Jane F. Holland. The house was not listed in the 1935-1937 Blue Books and 1935-1937 Lists of Residents, and was shown as vacant in the 1935-1937 City Directories. On March 24, 1937, 353 Beacon was acquired from Jane Holland by Bertha M. (Duchon) Brown Maguire, the wife of attorney Peter J. Maguire. They previously had lived in West Roxbury. They continued to live at 353 Beacon in 1939, but had moved to Brookline by 1940. On August 27, 1939, 353 Beacon was purchased from Bertha Maguire by Catherine (Leveroni) Casassa, the widow of John Casassa (who had died in October of 1938). Prior to his death, they had lived at 33 Myrtle. Living with her at 353 Beacon were her son-in-law and daughter, wholesale fish dealer Dean B. Mellish and Doris (Casassa) Mellish, her son, Mario Casassa, and her brother, Stephen Leveroni, a cook. She also accepted lodgers. Dean and Doris Mellish divorced in the early 1940s and by 1942 Doris Casassa had married to Dr. John Bacigalupo, a physician. After their marriage, they lived briefly with her mother at 353 Beacon and then moved elsewhere until the mid-1950s, when they resumed living with her. By the late 1950s, John Bacigalupo had died (or they were separated). Catherine Casassa continued to live at 353 Beacon until her death in December of 1959. Doris Bacigalupo and Mario Casassa continued to live at 353 Beacon; their uncle, Stephen Leveroni, continued to live with them, probably until his death in June of 1982. On March 7, 1986, Doris Bacigalupo, as executor under the will of Catherine Casassa, transferred the property to herself and Mario S. Casassa. Doris Bacigalupo died in January of 1993 and on July 16, 1993, Mario Casassa, as administrator of her estate, transferred the property into his own name. He died in May of 1997. Eugene Lepore and his wife, Lillian, inherited 353 Beacon from Mario Casassa. On March 29, 2001, 353 Beacon was purchased by David E. Asprinio and his wife, Kimberly L. Flood.